How does Sync2CRM Compare to PlusThis? PlusThis is a subscription service, created by Sixth Division, providing a wide variety of tools that extend the functionality of Infusionsoft. PlusThis costs $79/month. All features are included. There is no annual plan. Older subscribers may be grandfathered in at the old $59/month price. – Sync2CRM not only offers syncing of your Infusionsoft data to Facebook Custom Audiences but migration of Facebook Lead Ad form submissions as well. PlusThis does not. – Sync2CRM can sync an unlimited number of contacts who have a specific tag or are included in a saved search, to a custom audience in Facebook, as often as every three hours. PlusThis adds one contact at a time, using an HTTP Post in a campaign. They cannot keep entire lists synced, regardless of what process is updating the list. 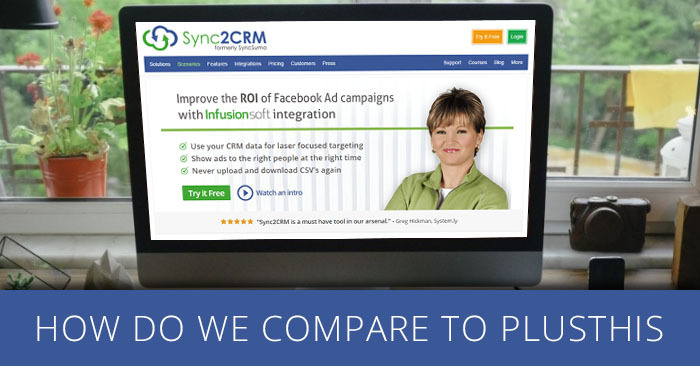 – Sync2CRM allows you to connect multiple Infusionsoft and Facebook accounts to one app. PlusThis does not allow multiple Infusionsoft or Facebook accounts. – Sync2CRM offers paid training courses for those who are new to either Infusionsoft or Facebook advertising. PlusThis does not have expertise or offer training on Facebook advertising.